Since the World Wide Web was conceived 25 years ago, it’s become a major reason why computers, smartphones and other data/communication technologies are integral parts of most everyone’s daily lives. Among other things, that means many more Americans are employed in developing, maintaining and improving those devices and the communications networks they use. Pinning down just how many, though, turns out to be rather tricky. How has that workforce changed over the past 15 years? That’s harder to answer. The first year for which estimates are available across all industries is 1997, nearly a decade after the Web went live and well into the first phase of the dot-com boom. And because occupational categories and definitions have changed over the years, not all the 1997 figures can be directly compared with the 2012 ones. Nonetheless, we selected the 1997 tech-related occupational categories that are broadly comparable to the 2012 ones, and found about 2.2 million such jobs — about 1.9% of the 1997 payroll workforce. 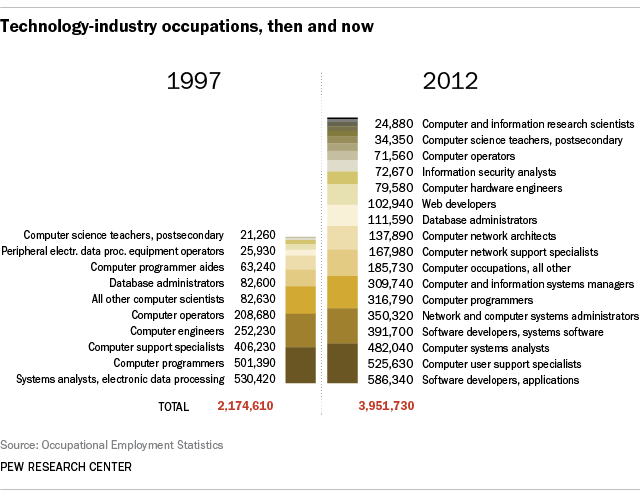 Perhaps more interesting than the raw numbers are the occupational descriptions, which convey just how different the structure of 2012’s technology industry is from that of 15 years earlier. Some occupations, such as web developers and information security analysts, simply didn’t exist back then (at least not under those names). Others have dramatically grown (programmers/software developers, support specialists) or shrunk (computer operators).